As our kitchens started filling up with modern conveniences some years ago, we also started replacing our manual coffee brewing methods with machines that run on electricity. These vary in complexity from machines that require some human interference to those that are fully automated. However, with this convenience you don’t necessarily get the best tasting coffee. That’s why having the best non electric drip coffee maker in your kitchen is actually a good thing, at least when you have a bit of time to tend to the brewing process. Use your electric machine for those rushed early mornings. Non electric drip coffee makers or pour overs, as they’re traditionally called, require you to pour hot water in a controlled manner through coffee grounds held in a filter that sit in a filter holder. This filter holder sits on top of a cup or carafe and can be made of metal, glass, ceramic or plastic. The design of a coffee maker can vary quite a bit, so you should have a general idea of how the pour over method works, as explained in this excellent Serious Eats article. The secret to many coffee drippers is to “bloom” the coffee grounds first. That means pouring hot water slowly over the top and soaking the grounds for between 30 and 90 seconds. The grounds will expand with the moisture and release carbon dioxide, making flavor extraction through the rest of the filtering process more complete. Once you know that, you’ll be ready to pick from our choices of best pour over coffee makers below. You’ll need a kettle that can pour slowly, maybe even an electric gooseneck kettle. If you think that all this is too much of a hassle, you could just stick with an electric drip coffee maker, or you could get the Behmor Brazen Plus that is an electric machine but gives you the option to brew into a manual pour over so that you don’t have to spend time tending over the process. You could also try a percolator coffee maker like the Presto 12 cup Percolator, which is coming back in style. The following pour over coffee maker reviews run the gamut in price and ease of use, so choose wisely. For the most discerning coffee drinkers who don’t mind waiting a bit for their coffee to be ready, the Chemex Classic Series Coffeemaker is made entirely of glass and uses Chemex filters that are extra thick to remove all oils from the grounds to extract only pure flavors. On a purely technical basis, you will get the most purest coffee from this unit than with any other dripper coffee maker. This is, by far, the most elegant dripper on this list. It is also the most expensive, but it comes with a carafe that is part of the coffee maker. A shaped wooden collar with leather tie surrounding the point where the cone dripper top and the carafe meet provides a method to hold the device without burning your hand, but you can forego this and instead opt for a glass handle if you prefer. Depending on the size you buy, the carafe can hold between three and ten 5 ounce cups of coffee in one pouring. Although you have to be careful using this pour over dripper because it is breakable, it is a fairly forgiving device and there is no risk of getting a bad brew unless you pour too fast. It does take a bit longer to make a cup because the filtration process is slower as you pour, watch and then pour some more, but this is the best pour over coffee dripper on this list. For a stainless steel unbreakable coffee dripper, the Kalita Wave 185 can give you about four 5-ounce cups with every filling. The Kalita is tough stainless steel and you can be assured that every last flavor profile will be extracted. The quality of the brew will be excellent even if you are not careful during the process. This is because of the ridged Kalita filters that are proprietary. They are a bit expensive but well worth it for the best results and very forgiving design. Also, as an option, you can get a Kalita pour over coffee carafe that fits the Kalita dripper perfectly. If you don’t want to worry about possibly breaking your coffee dripper and you like intensely flavored coffee but don’t want to have to be ultra careful and slow each time you brew, this is the one for you. Purists will tell you that stainless steel imparts a bit of a “tinny” flavor to your coffee even through the paper filters. That is up for debate, but if you want a coffee dripper that is very easy to use but doesn’t require expensive proprietary filters, the Bee House Ceramic Dripper might be the choice. It is capable of making up to 4 demitasse cups of coffee at a filling, and it is made to rest on the top of your coffee mug when dripping. The mug must be less than 3.5 inches in diameter, and the dripper will rest comfortably on top. Bloom the grounds first, and pour in hot water. The best part is that any cone #2 coffee filter will work. 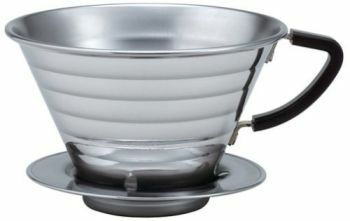 This is a good solid ceramic pour over coffee maker that will produce some excellent dripped coffee. This is a basic dripper coffee maker, and if you want no frills and just performance, check out the Hario V60 Coffee Dripper. With this dripper, you pour water directly in one go and wait for it all to filter through. It is fast and you don’t have to worry about how slow or evenly you pour the water, but you won’t have the cleanest of tastes becasue it uses the thinnest filters possible. This means you need not be concerned about the taste of the paper coming through but most of the coffee oils will make their way through. The wavy filter paper and the waves on the inside walls of the dripper help to keep the filter away from the walls so that there is minimal contact between dripper and filter. You can use 3 different types of dedicated Hario filters. A 01 size for 1 to 2 cups of coffee, a 02 size for 1 to 4 cups of coffee, and a 03 size for 1 to 6 cups of coffee. You can also choose between glass, plastic, metal or ceramic. The Hario V60 pour over coffee brewer is versatile and heavy duty, and the base will fit over a 4 1/4 inch cup or carafe top. No real bells and whistles here, just a fairly inexpensive non electric drip coffee maker that will work once you get it right. If you think that a plastic dripper isn’t worth the plastic it’s made out of, you might want to think again. The Clever Coffee Maker is made of BPA free plastic, and it is one of the best drippers that you can get. In fact, some coffee drinkers say that plastic is the best material to use if you want the least heat loss during filtration. Like all drippers, you’ll need a filter, but virtually any flat bottom type will work. You can place the dripper directly onto a mug, bloom the grounds and pour the hot water over the top to let it drain down into the mug, just like the others, or you can allow the Clever Coffee Maker to rest on its base with a valve closed that won’t allow the liquid to flow down. The closed valve allows the coffee to steep until it’s ready to filter down. Using the valve method, you can make your coffee as delicate or as potent as you want. Allow the water to flow through as you pour, mounted on a mug for light brown colored coffee, or rest the unit on its base with the valve turned off, and let the grounds steep for a darker or more flavorful cup of coffee. You can even use this coffee dripper to make tea, if you so desire. If you are not a purist and still want a cup of coffee exactly the way you like it, the Clever Coffee Maker is hard to beat. For a single serving dripper coffee, and with a price that is the lowest on this list, the Melitta Ready Set Joe Coffee Brewer is for you and is the easiest to use drip coffee maker on this list. Granted, it is made of BPA free plastic, which won’t appeal to coffee purists, but it is still a quality dripper that makes a great tasting cup of coffee. If you aren’t quite sure you want to get on the pour over wagon, you can buy this for peanuts and see for yourself. If you find your brew a bit too weak, try adding more grounds or grind your beans a little finer. Read our full review of this best selling tool here.